Whether you’re a local or visiting, Bend has a lot to offer when it comes to offering nourishing food and services that have your health in mind. Here’s a list of my favorite places in town to eat and spend time. My all time favorite coffee shop in Bend. Tucked away in Tin Pan Alley downtown Bend, these guys not only roast the best coffee but also use locally-sourced non-homogenized, small-batch pasteurized milk from Gary’s Meadow Fresh. If you don’t do dairy, they also make homemade cashew-almond milk for their drinks. So good! Their vanilla-bean whipped cream is also whipped by hand, so extra style points for that too. Lone Pine is definitely worth a stop if you drink coffee. Even their decaf is delicious. Jackson’s Corner was actually the first place I worked when I moved to town in 2009. They do an amazing job sourcing ingredients from local farmers and producers. Their fresh salads and pizza are the best in town. All the wheat-based products they make are made using organic, locally sourced grains and the breads and pizzas are also sourdough. They have both an Eastside and Westside location that are super family friendly and they make amazing seasonal specials that rotate weekly. This is a little tucked away ramen shop that is definitely worth seeking out. There are generally 3 ramen offerings and several other seasonal menu items that seek to capture the products that Central Oregon has to offer in the moment. Hyper-seasonal and seriously delicious, the ramen broths are true bone broths and organic wheat noodles or yam noodles are available. If you’re not feeling ramen, you cannot go wrong with any of the special menu items which are often salads or other wholesome bowls. Follow them on Instagram to be notified of any upcoming special events and brunch pop-ups too. Located in the hip and happening Box Factory, Fix & Repeat is a beautiful plant-based restaurant offering organic juices, smoothies and various acai and macro bowls. I love the Rice Bowl with brown rice, black beans, sweet potatoes, avocado, walnut pesto, kale, basil Mama Lil’s peppers and a cashew cream sauce. Yum! I also like that most of their smoothies include healthy fats like coconut milk, cashew and avocado rather than just fruit and greens. They have a generally fun vibe and a nice patio in the summer months. SYK is sometimes a restaurant and sometimes a yoga studio and as strange as that sounds they do a wonderful job with both. The restaurant sources a majority of their produce from local farmers and creates delicious bowls, veggie burgers and tacos as well as fresh juices and salads. The Pork Tacos and the Sunny Burger are my favorites! If you’re into a yoga class followed by breakfast, you’ll really be making the most of this sweet stop. This food cart is located outside of Spoken Moto (where you can bring your food inside if it’s cold outside) and they have amazing grass-fed burgers and pasture-raised fried chicken sandwiches. I always order my burger bunless and it comes served over fresh mixed greens to make a super satisfying lunch. They usually have a really good salad offering with ingredients that cycle with the seasons. I don’t eat at a lot of food carts but this one is always reliably delicious and does a great job with ingredient quality. Fairly new to the Bend scene, this plant-based cafe has an incredible menu full of nourishing gluten-free and vegan options. Love salads and bowls full of veggies? Or an occasional gf/v pastry? This is the spot! Despite the slightly industrial location, this cafe is a little haven with a lovely little patio to enjoy your meal. The Humble Beet is in the old Devore’s Good Food Store on the westside. While so many people were sad to see Devore’s close, there is so much to be excited for in the new ownership and vision of what The Humble Beet is doing. With beautiful organic and locally sourced produce, a coffee shop, groceries, as well as many of the old favorite grab-n-go items in the coolers The Humble Beet is offering many reasons to stop in. Their prepared foods are all non-GMO and moving towards using all organic ingredients. They are also in the process of finding the most sustainable to-go and prepared foods packaging solution available (think Pickathon Music Festival token program). Spork is a solid choice and has many gluten-free options and with a focus on a diversity of global street food, there is something for everyone. My top three favorite menu items are the Lomo Saltado, the Thai steak salad and the fried chicken (always gf). The vegetables curry is also delicious and perfect for a cold winter day. Expect a line because this is a popular spot but it’s almost always worth the wait. A Bend staple, Deschutes does a really good job with their food menu. All the potatoes for their fries come from Casad Family Farms, their beef comes from cattle fed some of the spent-grain from the brewery & much of their produce comes from local CO farms. They also bake all their own bread and make everything else from scratch. That’s pretty amazing for such a large volume restaurant. Pure Joy is located in the same building as Cafe of LIfe chiropractic office and has an extensive and thoughtfully created smoothie list and menu full of plant-based and keto-friendly items. This is another amazing cart worth mentioning. These guys are parked at Euro Sports in Sisters, OR. They also make sourdough crust pizza and frequently change their toppings to reflect the season’s abundance coming out of the local farms in the area. Also offering salads, eaters working with special diets are also sure to be pleased. Self-described as an indoor farmer’s markets, Locavore stocks locally-made/sourced products from a variety of farms and craftspeople. Lovely produce and a wall full of freezers holding thoughtfully-raised protein mean you can be sure what you’re buying is of the highest quality. This market also offers a membership program and community events, such as a weekly breastfeeding support group for local mamas. Agricultural Connections is an online farmer’s market and year-round CSA. 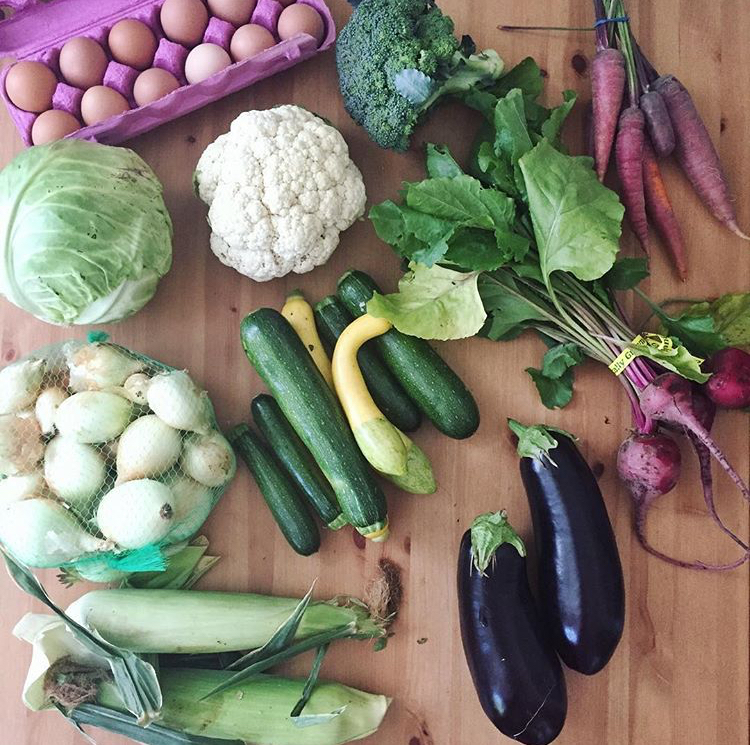 You can sign up for weekly produce boxes to be picked up at Locavore and there are many other products that can be added to your order each week, such as meats, eggs, dairy and select additional produce. I love this option for when the farmer’s market isn’t running and they offer several sizes of produce boxes to suit your family’s needs. I love that you can place an order each week or sign up for a subscription that can be cancelled anytime in case you’re heading out of town or want to take a break for a bit. Love this produce stand just outside of Primal Cuts Meat Market. They have a mix of homegrown produce as well as locally and globally sourced products to fill in the gaps. Open all week, it’s a great option if you want to grab some seasonal produce as well as some bananas and citrus but would rather avoid heading to the grocery store. I also love that it’s outside and they’re always playing reggae. Most people are familiar with this grocery store for their affordable organic options. Their produce is also generally fresh and pretty reliable in terms of consistency and quality. I love that they keep the nuts and seeds in the refrigerator but I do with you had the option to fill your own container for their bulk goods. They have great sales and a nice list of events featuring local wellness experts throughout the year. Check their website for current offerings. Just included this one for the sake of completeness. The Bend location does a pretty great job of supporting local businesses and sourcing from local producers. They've also partnered with Bend Farmer's Market to host the Eastside market, which is a great thing for that part of town. This place is wonderful if you're in transition, or fully transitioned, into clean skin care and beauty products. They carry some of my favorite products like hair products by Innersense Organic and mascara by TrueGlue. The items they carry are sure to be healthy for you and healthy for the environment and their staff is a wealth of knowledge for helping you select products for your unique needs. Angelina's has been around for a long time, making organic beauty products that work. I love their Rose & Cardamom Cleanser and their Skin Doctor Hand Salve. I haven't yet tried their Ayurvedic line of products but they might be next on my list. Check out their shop if you're cruising around downtown. Just walking into this spa you'll immediately feel relaxed and pampered! They use top of the line skincare products and have a full menu of services to choose from. I love their hot sand room that is the perfect thing on a cold winter day! You can drop-in for just a "Heat & Steam" or check out their membership options if you're local. It's such an amazing deal that'll help make sure your self-care happens on the regular! The soaking tub at McMenamins is an apres ski favorite in town. For that reason, it's often packed but totally worth making happen if you can. The open ceiling allows for peeks of sky through the steam and magical snow fall if you time it just right. At just $5 a soak, this is a water treatment at it's most affordable. It's worth noting that the water is chlorinated, if you're sensitive. If you're looking for a Barre class of haven't yet tried it, Bend's Barre studio is the place to go! The body positive message and balanced, functional work out is often just what a lady needs. I also love that workouts are just an hour, making them really easy to work into a day. They have a super sweet new mama special, $3 childcare and often pair with Athleta in the Old Mill offering occasional free classes throughout the year. Owned by longtime Bend yoga teachers, Ulla, Aleta and Rebecca, The Yoga Lab is one of my favorite studios in Bend. The teachers are amazing and they do a great job of offering a variety of classes in a super welcome atmosphere. In addition to her alignment-focused and thoughtfully sequenced classes, Ulla also offers classes appropriate for those who have experienced Traumatic Brain Injury (TMI). I don't make it to Groove often because they are located on the other side of town from where I live but I try and make it to as many of Cynthia LaRoche's Tuesday Rejuvinating Groove classes as I can. They are pure magic. Shanan Kelly is another one my favorites. Check out their extensive workshop offerings as well - they always have fun things going on. Tula is fairly new to the Bend scene and is tucked up in Northwest Crossings. The warehouse space housing their studio is beeee-utiful. They offer all kinds of classes from Aerial Yoga to Baby & Me, acrobatics, hula hooping, and so much more. Also, look out for their open studio times if you're looking for more self-directed movement. There really is something for everyone. I personally went for the Baby & Me classes and it was such a great way to connect with other moms and get out of the house with my babe in the early months. Also highly recommended is the big pile of bean bags of various sizes and shapes for lounging. Not to be missed!